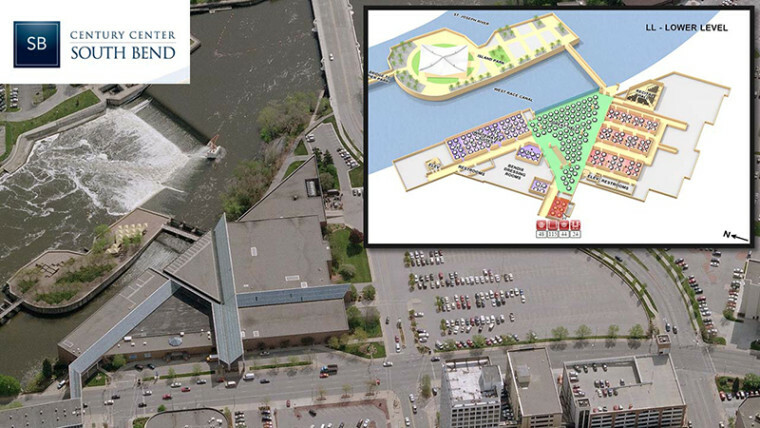 The first USA vFloorplan is live at Century Center, South Bend, Indiana, an SMG-managed facility, with 61,600 square feet of exhibition space on two levels and an island meeting space. SMG is the industry leader in facility management for public assembly facilities such as stadiums, arenas, convention centers, and theaters, and adds our latest interactive vFloorplan and capacity chart, to their website: http://centurycenter.org – click on ‘Interactive Room Finder’. vFloorplan 2.0 with lots of new features and impressive enhancements, and the new user interface which incorporates Capacity X-Ray, to enable much easier intelligent searching within all the information in the capacity chart, including features, and is all dynamically linked to the vFloorplans. The user choice is automatically inserted into a Request for Proposal using our new RFP Connect feature delivering a measurable, faster and easier way to generate leads. Crista Tompson, Director of Sales & Marketing, SMG/Century Center said “I was so impressed by the unique depiction of the spaces and room-sets, I knew I had to find out if Cubicspace could update the Century Center’s maps. Working with Steven and Cubicspace was easy and affordable! Seeing our completed project, I was amazed and pleased at how functional and clear the renderings were – Wow! 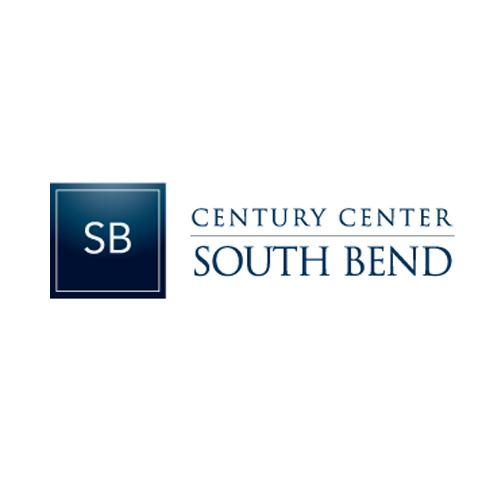 About SMG Century Center, the Century Center Board of Managers and the City of South Bend are committed to providing an exemplary destination for meetings, conventions, consumer shows, banquets, trade shows and entertainment. The main level features the largest space, a 25,000 sq. ft. Convention Hall. This space is column free and can be used as an impressive Main Hall or split into two halls. Also found on the main level is a modern 12,000 sq. ft. Discovery Ballroom with the ability to be separated into two halls if required. The lower level showcases the 16,000 sq. ft. Great Hall. This space is renowned for its grandiose 30 ft. glass floor to ceiling windows which overlooks the St. Joseph River. The Great Hall is ideal for hosting banquets and special events; as well as additional exhibit space. Eighteen meeting rooms, with over 35 combinations, complement the overall space. 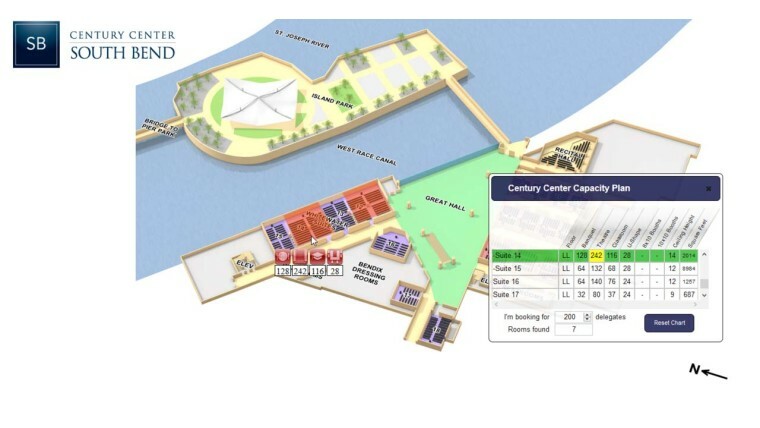 A pre-function area, located on the lower level adjacent to the Great Hall, is perfect for registration or receptions. The Century Center Convention Center conveniently provides access via an enclosed, climate-controlled skywalk to 292-Room DoubleTree by Hilton Hotel, and houses the South Bend Regional Museum of Art.